by Massat, Carol Rippey; Constable, Robert; McDonald, Shirley; Flynn, John P.
School Social Work: Practice, Policy, and Research has been a foundational guide to the profession for over 40 years. The first comprehensive introduction to the field, the book has featured the writings of the pioneers in the field while also accommodating the remarkable changes and growing complexities of the profession with each subsequent revision. The profession continues to grow in both the US and internationally, despite the ever-present concerns surrounding limited resources, budgets, and social worker to student ratios. Contemporary school social work takes place throughout the whole school and community, it takes place through policy change, and it takes place with at-risk students and their families as well as through individual and group work with students who struggle both emotionally and academically. 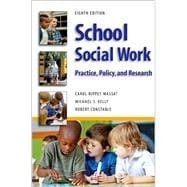 This book reflects the many ways that school social work practice impacts academic, behavioral, and social outcomes for both youths and the broader school community. Carol Rippey Massat (MSW, PhD, University of Illinois at Urbana-Champaign) is professor and director of the social work program at the Indiana University, School of Social Work. She served as editor of School Social Work Journal for ten years and is the author of numerous social work publications. Michael S. Kelly (MSW, PhD, University of Illinois-Chicago) is associate professor of social work at Loyola University Chicago. He is the associate editor of both Advances in School Mental health Promotion Journal and the International Journal of School Social Work. Robert Constable (MSW, Loyola University, DSW, University of Pennsylvania) is professor emeritus of social work at Loyola University Chicago. He was lead editor and author on the first edition of this textbook, marking the first ever comprehensive introduction and guide to school social work. He is author of more than 100 publications in social work.